You may have decided that going out for New Year’s is not an option, or simply prefer to ring in the New Year at home. If you’re having guests or family over to celebrate, you’re probably looking to dish up some celebratory fare that complements the dazzling fireworks display. But serving up fun, refreshing drinks and some tasty treats can get overwhelming when you want to entertain your guests as well! Check out these top 7 kitchen essentials that make hosting (and enjoying) your party a breeze. What would a New Year’s Party be like without some fantastic refreshments? Most of the work with drinks happens in the prep (e.g., dicing limes, chilling drinks, washing herbs and fruits for cocktails). If you prep these things well in advance of the party, you’ll have more time to celebrate and share in the festivities. Whether or not you choose to include alcohol as part of your menu, these kitchen tools can be used to make a variety of fun drinks with or without alcohol! Keep in mind, it’s difficult to enjoy yourself if you’re stuck behind the bar all night. So pick up some of these awesome kitchen essentials today, and be sure to prep the bar/refreshments area ahead of time. There are an unimaginable number of corkscrews on the market today. They range from $2 all the way to $200, some manual and some electric, some come with additional features and others are more simplistic in design. With this many to choose from, it can get overwhelming to say the least. Personal preference is a big part of deciding which to purchase. While many wine enthusiasts prefer the traditional waiter’s corkscrew1 (and it conveniently costs $5 for a good one), others with less strength in their hands and forearms might consider purchasing an electric opener. It may also be prudent to purchase an electric opener when you will be opening a large number of bottles. What’s most important, is that you learn to use whichever model you purchase before the party to ensure the bottles open easily and quickly. No one wants cork in their wine, so practice with your chosen model beforehand. Bonus! You’ll also look like a pro in front of your guests when you pop open the champagne with finesse! Whether you’re adding a little kick to your kid-friendly punch bowl, or you need a splash of citrus for that cocktail, a lemon/lime squeezer is hands down one of your best friends! Imagine juicing lemon after lemon when you just nicked your finger with a knife not five minutes back! Oh the agony you could have avoided, if only a citrus squeezer had made it into your party pantry arsenal. Keeping hands with dry or cracked skin away from citrus can be a life saver. In addition, squeezers maximize the amount of juice you can get from one fruit in a very efficient amount of time. Manual squeezers have a simplistic but effective design needs no introduction for proper use, and it catches the seeds too. Mixing together the perfect blend of spices, herbs, and fruit can take the party refreshments from so-so to stunning. If you take your cocktails (or mocktails) seriously, you must own a muddler! There are techniques for using one, so it would be important to pick it up early and practice, but what a fun afternoon activity. While there are a variety of muddlers to choose from, no need to go big and expensive, check out this simple and effective muddler by Native Spring®3. It has a nylon tip with grips to make sure the fruits and herbs don’t bounce around in the glass. The softer tip also helps newbies from crushing the herbs (never crush, always push down gently!). Having to prep and cook while your guests are celebrating the upcoming New Year can be a major bummer. Be sure to plan out your menu ahead of time. It also helps to have a basic timeline to guide the prep and cooking of your entire menu. Once you’ve got the details down, stop by a store to pick up some of these helpful tools. Whether you’re planning a three course meal, or a buffet with simple hors d’oeuvres, these kitchen essentials are great for saving time and serving up some fantastic fare. This investment is not just for your amazing New Year’s Eve party. Every serious cook needs to have a serious set of knives. Yes, you have to be careful when using them, but overall, sharp knives allow you to work faster and surprisingly safer as well! Have you ever tried to cut into a vegetable and found yourself gritting your teeth while trying to push the knife through? This is a sign your knife is failing you! Sharp knives mean you can use less force, which essentially means less damage is done to your food during the slicing process. More importantly, a dull knife can slow you down and keep you in the kitchen when you should be out enjoying the party. While it may seem unintuitive, sharper knives are safer to work with too. When cutting with dull blades, the chances of slipping and cutting yourself increase exponentially. So do yourself (and your food) a favor – invest in a high-quality set of knives! How can such an inexpensive and essential item be missing from so many kitchens! This is the ultimate party purchase for a kitchen-minded host. There are a wide variety of choices, so find one that suits you. Instant read thermometers can be set to sound an alarm when your food reaches its ideal temperature. This means you can set it and walk away to enjoy the party without ever worrying if you’ve over-cooked the main dish. On the other hand, you wouldn’t want to serve your guests undercooked meat! This little gadget is a lifesaver as it takes all the guess work out of cooking meats to the recommended temperatures. Remember, meats typically continue cooking for some time after being removed from the oven or grill, so it’s best to set the alarm to go off just slightly before the desired temperature is reached. So many home cooks will shy away from this amazing essential! It might seem a little too fancy, or maybe unnecessary. But kitchen tweezers have a multitude of uses and will find themselves right at home in the coziest of kitchens. Have you ever tried removing small items from narrow jars, or struggled to get that pesky egg shell out of the bowl? Voilà! The kitchen tweezers are here to help. While tongs are also a great kitchen staple, they tend to be too big to accomplish many of the tasks required in a home kitchen. Yes, the most obvious essential for last! You would be surprised how many cooks lack a good quality apron. One of the biggest sins of throwing a party is to walk back and forth between the kitchen and your party without using an apron. If you put the apron back on when working in the kitchen, spilling a glass of wine, a ladle of tomato sauce, or a cup of coffee would be a slight setback. But if it landed on your outfit, you’re doomed to show off the stains for the rest of the night. It is also more sanitary when preparing food to cover your party clothes. When choosing an apron, style is an obvious decision-maker for many. But don’t forget that your apron should still look sharp and help with sanitization. There are also several different styles to consider: server, bib, bistro, and dishwasher. For entertaining in your party clothes, the obvious choice is a bib apron as it protects you the most from spills, and allows you to wipe your hands (finding a towel when you’re in a rush to entertain is not always possible). Make sure you pick an apron that fits you well and is made of a durable material. Regardless of the number of guests, or courses to your meal, each of these kitchen essentials should find a way into your home. 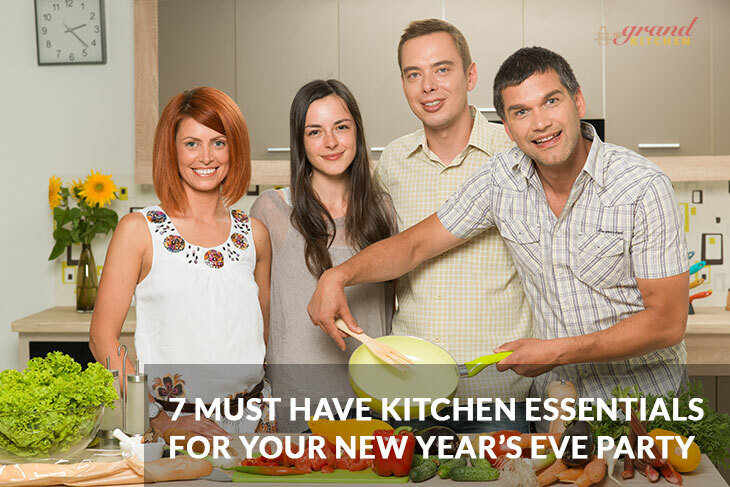 They are an indispensable means of enjoying both cooking and entertaining, and will most certainly help you ring in the New Year with kitchen cheer!